Is Measles Outbreak a Preview for Colorado? The BBC reports that more than 41,000 people in Europe have been infected with measles in the first six months of 2018. There have been 37 deaths caused by this outbreak. Of the 57 states, districts, territories, and commonwealths in the most recent CDC report on kindergartners who had received the measles, mumps, and rubella vaccine Colorado ranked last. Just 87.3% of kindergartners had received the two doses needed to protect them. In the Ukraine, where 23,000 of the cases in 2018 have occurred, there have been years of problems getting the population vaccinated. Wars, lack of vaccines, and a medical system that makes the US look like a model of competence and efficiency caused the rate to dip as low as 31% of 6 year olds in 2016 from a high of 95% in 2008. The WHO estimates there were 621,000 under- or unvaccinated people in Ukraine in 2017. The good news is that about 80% of them have been given at least a first dose of the MMR vaccine. The bad news is that the outbreak will undoubtedly be used by anti-vaccine lobbyists to “prove” that vaccines are the problem. Ignoring the inconvenient fact that the countries with the lowest vaccination rates are the places with the most infected or dying people. In 2017 Italy has a similar vaccination rate to Colorado at 85% of school aged children being vaccinated (The Guardian). The 2018 August ECDC report on measles and rubella found 3,341 cases in that country since last year with a rate of 55.1 per million. Five people have died in Italy in the last year. 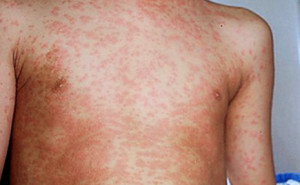 A similar outbreak in Colorado would cause 300 cases of measles. Colorado is one of 16 states that allow parents to opt out of vaccines for “personal reasons” instead of religious or medical reasons. Independent voter interested in the analysis of the "whys" of politics. Resident of Denver, Coloradan since 1980. That's definitely a concern. Anti-vax dumbassery spans the political spectrum, and only seems to be getting more prevalent. I've encountered multiple people who self-identify as lefties but voted for Trump based on some dipshit tweets he made about vaccines and autism, and on the recommendation of people like fraudulent quack ex-doctor Andy Wakefield. It's been almost fun rubbing these single-issue morons' noses in the fact that Trump has appointed a string of pro-vaxxers and/or Big Pharma shills to the FDA, CDC, Dept of HHS, Surgeon General's office, etc. Given the numbers of people who can be convinced by the merchants of doubt and the 95% uptake needed to protect everyone I think we need to be as hardline on this as California. Everyone in schools or daycares needs to be immunized unless they get a medical exemption from a doctor.